Losing hair along the temples or front hairline is distressful. While it is commonly caused by styling hair aggressively, other serious problems could be the reason behind it. Hormonal and reproductive problems have been pointed out to bring about such symptoms as general hair loss. Some medications, stress, some thyroid problems may also be behind reduction of hair along the sides and forehead in young females. More on this later. First, what is considered recession? 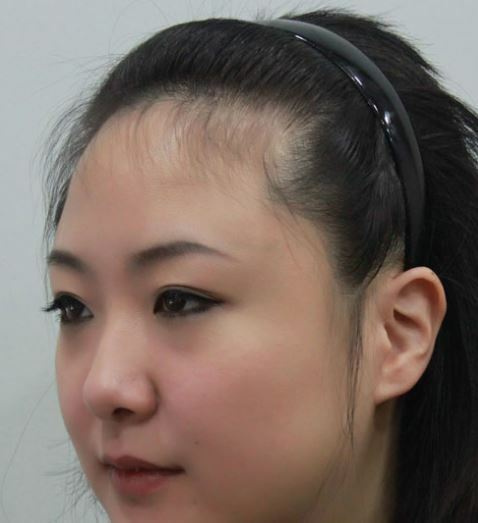 What is receding hairline in women? It refers to the loss of hair progressively along the hairline (and temples) as experienced by both men and women. The result is baldness to varying degrees. Hair loss along temples and forehead. While the phenomenon occurs in both men and women, it is generally more serious in women than in men. The process begins with the hair thinning out on both sides of the head before progressively moving backwards. Most women have a major drop in confidence and self-esteem once they experience a such hair loss. 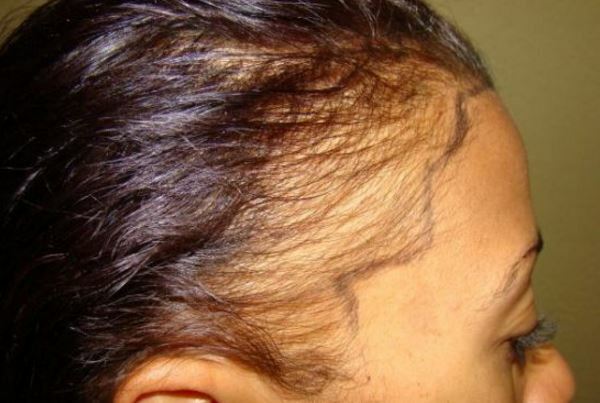 However, all is not lost as many remedies and treatments are readily available for those experiencing a female hairline recession. Front hairline recession is more prevalent in young black women and may be linked to hairstyles and lifestyle. Here are the causes of a receding front hairline, treatment options and natural home remedies to fix it. PCOS is a condition in which the hormones of the body are out of balance in a woman. It has many symptoms which include changes in the periods and in some cases heart diseases and diabetes. One of its many symptoms include small cysts on the ovaries and loss of hair.. The main cause of a such alopecia is your genetic predisposition. If the gene of baldness runs in your family, you are at its mercy and little can be done to keep baldness at bay. The hair follicles on the side of the head are among the most sensitive to the (DHT) dihydrotestosterone hormone. For those with the baldness gene, these follicles are more responsive to the DHT hormone than in those without the gene. The use of some medicines is associated with the loss of hair either at the edges of the scalp or the whole head. Medications for gout, cholesterol, depression, heart disease, blood pressure and others have the side effect of leading to hair loss. Chemotherapy treatment for patients with cancer often leads to the loss of hair on a large scale. This may continue even when one has finished the treatment regime. The presence or absence of the dihydrotestosterone hormone determines whether one will have a receding hairline or not. This hormone has a negative effect on the growth of hair at the front and sides of the head. This hormone makes the hair follicles shrink so much that the hairs that grow from them are so thin that they easily fall out. The hormone also prevents the growth of hair thus making the affected areas bald. Stress in excessive amounts can lead to poor general health due to the effects it has on other bodily processes. While people respond to stress in different ways, poor nutrition is one of the effects of stress. Either one will eat too much or too little food to lead to general poor health. Other people increase their alcohol and drug intake when stressed. All of the changes one observes during periods of stress have visible effects on the body one of which is the loss of hair. When one has poor nutrition, they will likely have various symptoms to indicate that a certain nutrient is lacking in their diet. Poor skin and hair appearance often indicate that one is having issues with their health. Loss of hair is one such symptom of poor nutrition. The use of beauty products such as hair gel has been linked with the loss of hair for quite some time. When used in excessive amounts, some beauty products may become unhealthy to the scalp and lead to the loss of hair either at the edges or the whole scalp. Those who keep changing their hair products are also at the risk of losing their hair when the different chemicals react unfavorably. With age, the body experiences many changes including the loss of hair. A receding front hairline in old age may be due to many factors one of which is the presence of the baldness gene. Other people without the baldness gene may still experience hairline receding due to the natural cycles of the body. You can experience a loss of hair when you have issues with your thyroid. Whether your thyroid is overactive (hyperthyroidism) or underactive (hypothyroidism), you may still experience a loss of hair either at the front forehead or in patches across the whole head. When one is pregnant, they will have lower levels of the estrogen hormone and higher levels of progesterone. This difference often leads to many changes in the body one of which is the loss of hair on the temples and forehead. This may not be the case in all women, however. A scalp infection such as ringworms and dandruff attack the hair follicles leading to the loss of hair in the infected patches. While the infection can be treated and hair regrown, some have long-term effects especially if they were left to stay for long or leave scars. After an emotional or physical shock, some people will experience a general loss of hair on a temporary basis. Such trigger events include death in the family, sudden loss or gain of weight, surgery, high fever and others. The hair will eventually grow back. Alopecia areata is a condition in which the immune system attacks the hair follicles of the body leaving some patches on​ the skin without hair. 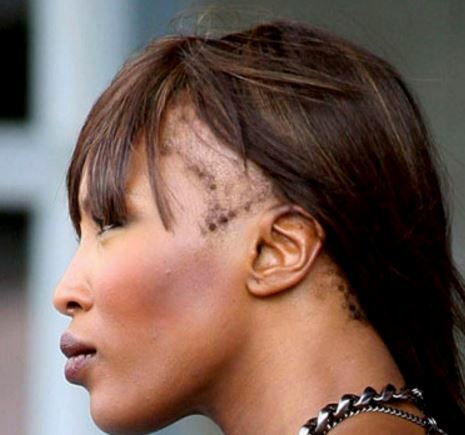 The symptoms of alopecia areata include smooth and bald patches on the skin including the head. Some hairstyles such as cornrows and pigtails pull hair in some areas which may jerk them off from their roots leading to hair loss in what is known as traction alopecia. Hair treatment methods such as the hot oil treatment inflame the hair follicles which may lead to hair loss. Some disorders of the skin may lead to such a symptom or a general loss of hair either temporarily or permanently. Some diseases and infections cause scarring alopecia and may lead to permanent hair loss. Diseases such as sarcoidosis, lichen planus and certain variants of lupus cause hair loss to various degrees. When one has radiation therapy to the head, the hair may be lost permanently. Trichotillomania is the hair-pulling disorder in which people experience an intense urge to pull hair out from various parts of the body. This condition can affect any part of the body be it the scalp, eyebrows, eyelashes and other areas. On average, the head has about 100,000 hair follicles that grow a new hair every six years or so. After they fall out, another hair grows in its place. However, if the hair does not grow back, baldness will be the case. The presence of the polycystic ovarian syndrome induces a chronic hormonal imbalance in the body. Patients of PCOS will experience a higher level of androgens (male hormones) with symptoms including thinning hair on the scalp and hair growth on the body and face. In some cases, you may experience weight gain, acne and ovulation problems. There are chances that persistent alopecia in black women is caused by PCOS. During pregnancy, the body has high levels of hormones which support hair growth and prevent falling out of the same hair. Most women will thus experience a fuller hair growth. However, after giving birth, the hormones will drop in their levels leading to hair falling out in large amounts at once. This, however, is a temporary issue as the hair will grow back fully after about 2 years or so. Stress can intoxicate the hair follicles leading to hair falling out. If not handled early enough, stress can cause massive loss of hair and other health conditions. Most people with thyroid problems will experience a fallout of hair whether it is a case of hyperthyroidism or hypothyroidism. Other symptoms of thyroid problems include gaining or losing weight, heart rate changes, increased sensitivity to heat or cold and many others. This occurs when the body’s immune system mistakenly attacks the healthy hair follicles making hair to fall out in patches. In rare occasions, this condition can lead to a total loss of hair on the scalp or skin. It is a temporary situation as the hair should grow back after half a year or so. For those with a family history of hair loss, taking the pill may lead to hair thinning out. In others, the thinning of the hair occurs after they stop using the drug. Drugs for depression, arthritis, heart disease, high blood pressure and general blood thinners are also known to cause a thinning of hair. Each of these conditions has its specific symptoms that should enable your medical doctor find it out. Luckily, each of them has its own remedy. Young women can also experience hair loss due to various reasons one of which is a genetic predisposition (baldness in the family). In other times, one may lose their hair especially when they are using steroids to build muscles. In young women, the loss of hair is often temporary and the hair will grow back with proper care. Thinning hair along the temples and forehead may not be noticed early enough for most women as it occurs very slowly such that one only realizes their hairline has receded when it is late. However, focusing on some changes in your daily hair routine can help you establish whether you are losing hair or not. After taking a bath, look at the floor or the bathtub and take a note of the amount of hair left there. If you notice more hair than the normal amount, you are suffering from hair loss. The first sign of losing hair is to observe your hairbrush each time you brush your hair. If you notice lots of hair on the brush than usual, you will be losing hair. Another aspect to take note of is using the hair tie or band you tie your hair with. If you need more loops to tighten the hair than you usually did, then its volume would be gradually reducing through hair loss. The most obvious sign of hair loss is the actual receded hairline on a woman’s hair. If the hairline has moved back compared to its normal position, you should take the needed measures to prevent further loss of your good locks. Also, if you notice a general reduction in the volume of your hair, you need to take the needed steps to keep and even increase the volume of hair on your scalp. Hair transplant is a medical procedure by which a patch of hair is taken from a donor site and transplanted to a recipient site. The recipient site is often a balding site on the scalp. Hair follicles are taken from a part of the body that is resistant to balding then grafted to the bald area. It is advised that one does a hair transplant when they are old or has finished losing their hair given that the balding process can still continue even after the transplant. Laser light therapy is used to stimulate the growth of hair by using laser light to improve the circulation of blood and general health of the scalp. It is not a complex procedure as it involves a brush-like comb being massaged on the head. It can be even performed at home with devices such as the HairMax LaserComb. Hairline surgery would focus on altering the scalp which is being affected by the baldness to make it better at growing and retaining hair. In women, hair is lost mostly at the front of the head, or the sides. Before surgery, however, it is advised that one goes for other less invasive procedures before considering surgery. Propecia was originally created to prevent prostate cancer by inhibiting the production of the dihydrotestosterone (DHT) hormone. The DHT hormone is the main culprit that shuts down hair follicles and results into baldness. It acts as a fertilizer for hair. This medication is only to be used under the directions of a medical doctor. While there is no shampoo that can prevent the loss of hair or grow it back, the Nioxin shampoo will feed your scalp with the right nutrients to stimulate growth and give off a healthy look. Through various treatments and styling, the scalp can be stimulated to grow back hair. Hair loss therapy can be used any time one feels their hair is thinning out or falling off. How to stop hairline from receding without using drugs and surgery. If you don’t want the drugs and are skeptical about the surgeries, you can put the following methods to use. If you notice any loss of hair, you can take amino acids that boost the amount of collagen and keratin in the body. These are the building blocks of hair, nails and the skin. You should avoid alcohol and alcohol hair products if you want to have a healthy scalp. Alcohol can dry up your scalp leading to the chocking of hair follicles. The sebum produced by the skin should be removed from the scalp every now and again. Otherwise, it will mix with pollutants and hair products to create a toxic layer that will attack the hair follicles and prevent the growth of hair. While a morning shower will solve the issue of sebum accumulation, some people may require to use shampoo to break down the sebum and have a healthy scalp. Stress can cause loss of hair and poor health in general. Leading a healthy lifestyle should do away with stress and preserve your hair. One way to cure a the problem in women is by stimulating the scalp for improved blood circulation. This can be achieved through massage every once in a while to supply the scalp with enough nutrients to grow hair. While you undertake the needed measures to restore your hairline, you can use the following hairstyles to hide a receding hairline. Whatever hairstyle you pick on, make sure it’s loose so that it does not worsen your thinning hair. Daily Mail Online. Receding hair, the new epidemic in older women.